With space technology, new energy utilization and atomic energy technology develops rapidly, refractory materials have a wide application by right of advantages of thermostability, corrosion resistance and washing-out resistance. Some refractory materials are used in electric resistance furnace, such as chamotte brick, alumina brick, chrome-magnesite brick and dolomite brick; some materials are used in furnace for heat treatment, such as fire clay brick, high-alumina refractory, lightweight refractory and light weight fireclay brick. 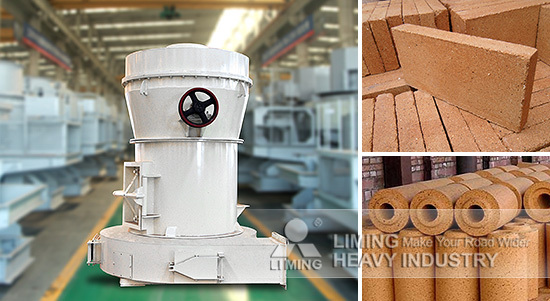 Based on specific quality characteristic of refractory materials, LIMING researched and produced patented YGM High pressure suspension mill to solve the problem about grinding ultra-fine powder, and it has been played an important role in grinding refractory materials. Compared with other machines’ capacity, YGM High pressure suspension mill’s is improved by 20-30%, and grinding pressure is improved by 20-30% under the action of high pressure spring. Besides, sizes of final products have a large rang, such as the thickest is 20 mesh, and size of fine powder is usually 425 mesh, and a little powder can be 1000 mesh.